FREE SHIPPING* on 4 bottles. Italy’s love affair with Sangiovese is generations old, and they’re not alone. The long line of admirers stretches around the world, and bottles like the 2012 Fietri Riserva lend reason why. Our Panel called it "one of the more elegant Chianti," adore it for letting the signature Tuscan grape shine. Here, it’s a Direct Import, estate-bottled beauty at a wholesale price that makes it especially easy to adore. • Critic Favorite. James Suckling urges, “Buy top Chianti Riservas at will,” and this soft and juicy wine makes the rank. 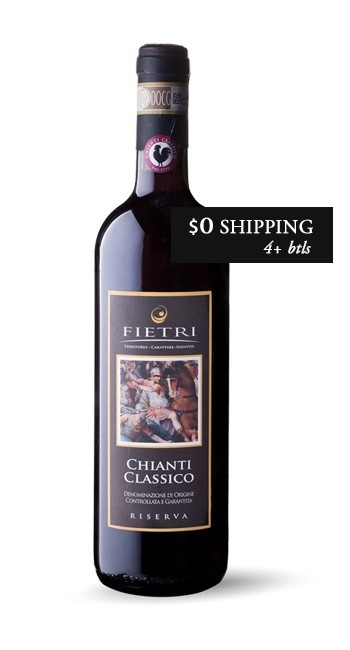 After blind-tasting about eight dozen 2009 Chianti Riservas on a summer trip to Tuscany, Suckling listed the Fietri from producer Cuido de Capua among his 16 favorites. • Promising Vintage. The 2012 season produced stellar Chianta Riservas aplenty, partly due to late ripening harvests that seemed to particularly benefit Sangiovese in Chianti Classico. 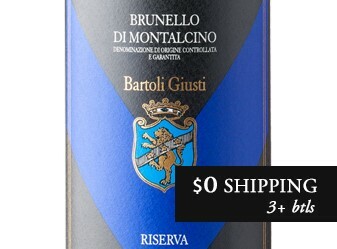 And while some of the priciest wines are at the same level as ultra-famous Brunello di Montalcinos, others can be found at a fraction of the cost. At sub-$25, the Fietri is a steal from under the Tuscan sun. • Tuscany's Signature. The saying goes, “You can make Cabernet or Merlot anywhere, but Sangiovese is special to Tuscany.” This Riserva comes from a newer house strategically situated in the Gaiole region, a very good area for Chianti with sandy clay loam texture centrally located between the Florence, Arezzo, and Siena provinces. • Treated to Perfection. This estate-bottled beauty features modern styling and a bundle of roses and sweet cherries in the glass. For having spent 20 months in large Allier casks, the oak is remarkably understated and the fruit pure and delicious. It’s worth noting that that the winemaker added a little Merlot and Alicante to the Sangiovese for the Riserva blend, boosting richness and depth for a racy, refined wine—and one that’s a great representation of the Classico region. This well-balanced blend of 90% Sangiovese, 5% Merlot, and 5% Alicante is a voluptuous, silky wine with brooding black cherry fruit and notes of roses and wild herbs. The grapes were taken from a careful selection of fruit from the single cru Vigna Carletti. Pure and delicious with lots of richness and depth. The Fietri Estate offers one of the most striking and characteristic areas of the Italian agricultural tradition, in the heart of the geographical area of production of wine "Chianti Classico." Compared to other agricultural areas that do not follow old traditions, Fietri's land features terraces, embankments, olive trees, vines, and woods that remain true to the work done over the centuries. The company has renewed all the vineyards across ten hectares, paying particular attention to the characteristics of the new plants in the production of high-quality wines. Since its completion in 2006, the winery has been producing and bottling the wine direct. Since putting the wine into the market in 2009, the winery has successfully entered into the US and UK markets, introducing wines into northern Germany and selling in the local market in central and northern Italy. The company began producing wine with the 2006 vintage, using grapes from the new vineyards planted in 2003. The grapes types are: Sangiovese (64%), Merlot (12%), Alicante Bouchet (12%), Chardonnay (6%) and Viogner (6%) using selected clones and rootstocks chosen for the specific characteristics of the soil and microclimate. Despite the youth of the vines, the growers have been seeing an exciting return from the investment and are very pleased with the reception that they are already enjoying in the top Italian guides. They have been awarded Bronze medals by the International Wine Challenge in London and Decanter Magazine, and a 3 Stars “Sehr Gut” rating at Prowein in Germany. In the classic Italian form, this bottle is made to be paired with homestyle cooking. We love it with pork, veal, eggplant parmasan, soup, and pasta with red sauce, especially bolognese or lasagna.